Ride a bike: Bike cleaning! Shhh, it's an early birthday surprise. 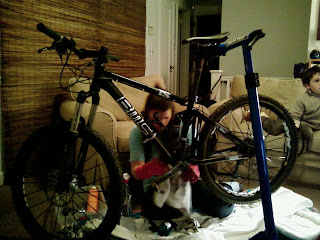 While he was out of town I snuck over to his house and cleaned three of his bikes. Well to be truly accurate you snuck over and temporarily *stole* three of my bikes, and cleaned them at your house. Yes, true. I was totally scared to be taking your babies too. I didn't know if you liked Pledge on the frame (some people are totally anti-Pledge) so I just cleaned them with water. I didn't know if you prefer wet or dry lube- I used wet. The fender is rubbing inside your chain stay on the right side, really really badly. The cassette has a little bit of rust, there's a broken light mount, and there's a cable fraying by the front derailleur, but it's past the bolt. Please feel free to steal any of my bikes for the purpose of interstate cleaning and reporting on things that need fixing.